Only signage so far with the new name. Good to be freezing in a rink again! The new signage outside the CIA. 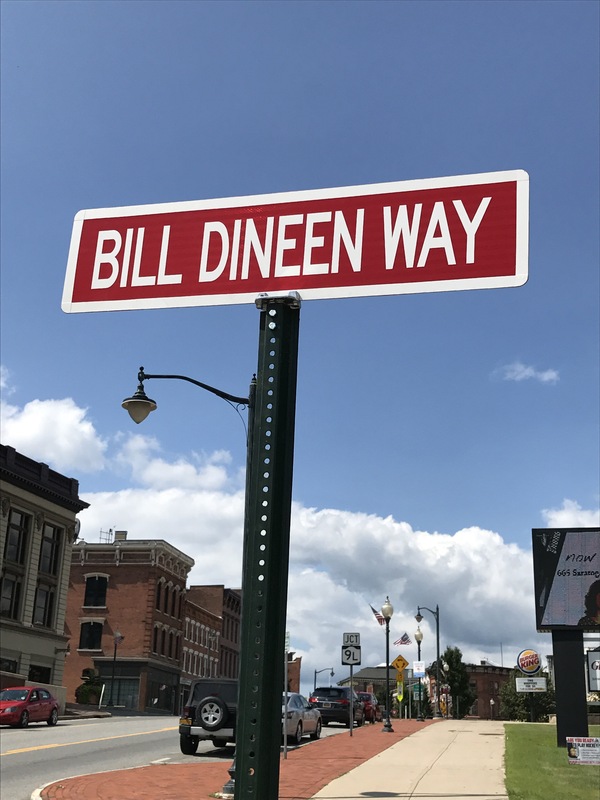 -On Thursday, the lot outside the entrance to Cool Insuring Arena–which had been known as Civic Center Plaza–was renamed Bill Dineen Way, to honor the former Red Wings coach who passed away in December. -Forward Brian Ward signed a one year contract on Friday, returning for a second season. A key member of the offense, Ward started the season in Albany’s training camp, joined the Thunder in early October, and would lead Adirondack in goals with 27. He would go on to finish his first full pro season with 49 points in 49 games. He also made 8 appearances with the A-Devils, picking up one assist. Ward was named the ECHL’s CCM Rookie of the Month for March 2017 after picking up 8 goals and 9 assists in 11 contests, including his first career hat trick. Week 27 in Review: We’re Not Done Yet. It’s not time to give up the boys yet. There’s a Calder Cup that needs to be chased first. Wednesday’s mission was a pretty simple one: beat Hartford without going to a shootout, and hope that Syracuse lends a hand and defeats Utica, and hello playoff spot. At first, it looked like the Wolfpack were going to play spoiler: a John Gilmour goal just 1:46 into the contest would put Hartford up 1-0. Vojtech Mozik would tie it up later in the period with a power play goal, his 10th of the season. The Wolfpack would take a 2-1 lead early in the second period on Marek Hrivik’s 16th goal of the season. But the Devils would respond…while on a penalty kill for a too many men call, Kevin Rooney would break from the pack (see what I did there?) and score shorthanded on his own rebound to tie things up at 2. John Quenneville would add a power play goal late in the second, his 14th, to put the Devils ahead 3-2. In the third, Albany would put the game away with three straight goals…Miles Wood, in his first game back in Albany since a brief stint in November, would score his 4th, then assist on Jacob MacDonald’s 8th. Ben Thomson would celebrate his return from New Jersey with his 6th, putting the Devils ahead 6-2. Nicklas Jensen would add his 30th goal as time expired, but it wouldn’t be enough. Mackenzie Blackwood would stop 23 of 26 shots in his 16th win. MacDonald lead all Albany skaters with three points (1 G, 2 A), Blake Coleman had two assists, and four other Devils would have one assist each. Just minutes after the final horn, Syracuse would finish off a 7-2 win at Utica, officially putting Albany in the playoffs. Power Play: 2 for 5. Penalty Kill: 6 for 7. Penalty Minutes: 22. Shots on Goal: 31. Shots Allowed: 26. 3 Stars: 1. Jacob MacDonald; 2. Miles Wood; 3. John Quenneville. With quite a few regulars being rested, it was due west on the Thruway to Rochester for the final regular season road game against the Amerks. Carter Camper’s 6th goal of the season would put the visitors on the board 13:10 into the opening period. On a late turnover by Josh Jacobs, the Amerks would tie the game up late in the period on a Casey Nelson goal. Joe Blandisi would break the tie early in the second period with his 8th goal, and first since returning from New Jersey. But a scrum behind the Amerks net that would give Rochester a full 5 on 3 would change the tide…Alex Nylander would re-tie the game at 2. Jan Mandat would briefly give the Devils their one goal lead back, only to have a second power play goal, this time off the stick of Derek Grant, late in the second for a 3-3 game. The Amerks would pull away fairly quickly in the third…Justin Bailey’s 23rd goal just 43 seconds into the final period would put Rochester up 4-3. Hudson Fasching would add an insurance goal four minutes later for a 5-3 lead. Nick Lappin would get the Devils back to within one with 37 seconds remaining, but that was all they could do. In his first start in 13 days, Ken Appleby would stop 26 of 31 shots. 8 different Devils would add assists. Power Play: 0 for 3. Penalty Kill: 6 for 8. Penalty Minutes: 16. Shots on Goal: 34. Shots Allowed: 31. 3 Stars: 1. Justin Bailey; 2. Evan Rodrigues; 3. Derek Grant. Less than 24 hours and about 220 miles to the east later, the Devils and Amerks met in Albany for Game 76, the regular season finale. Much like the night before, it would the Devils drawing first blood…Brian Gibbons would score his 16th of the season 6:56 into the contest for a 1-0 lead. Vojtech Mozik would add his 11th goal early in the second period to double the lead. Then Blake Coleman would cap the game and the regular season off with a short handed empty netter, his 19th, to finish the Amerks off. Mackenzie Blackwood took care of the rest, stopping all 17 shots in his third shutout of the season. Coleman would add two assists, while Nick Lappin had one helper. Power Play: 0 for 3. Penalty Kill: 4 for 4. Penalty Minutes: 8. Shots on Goal: 34. Shots Allowed: 17. 3 Stars: 1. Mackenzie Blackwood; 2. Blake Coleman; 3. Brian Gibbons. A tough call for this week’s honors, but I’ll split it between Blake Coleman (1 goal, 4 assists in 3 games) and Mackenzie Blackwood (2-0, 1 SO). Final stats will be out on Monday. So in round 1, you will have Syracuse-St. John’s and Albany-Toronto (in a rematch of last year’s epic 7 game North Division final). Not a good start for Adirondack in their first round matchup with Manchester, as they fall 2-0 in their best of 7 series. The Thunder would drop Game 1 to the Monarchs 3-1, with Ryan Culkin the lone goal scorer and J.P. Anderson would stop 21 of 23 shots. Manchester would follow that up with a 4-2 win in Game 2 on Saturday. Alex Wall would score both Thunder goals, while Anderson stopped 24 of 27. The series now shifts to Glens Falls for the next 5 games. Yes, I said 5…due to the circus at SNHU Arena, the Thunder will host the remainder of the series, no matter how many games needed. Game 3 is on Tuesday, Game 4 Thursday, and if needed, Game 5 is Saturday. As far as coverage…preview stat pack will hit Thursday afternoon prior to Game 1. If I am able to switch my work schedule, I will be on hand for Game 1. Games 2-5 I will definitely be around for. It’s time to take a #FinalStand everyone. Author icepuddlePosted on April 16, 2017 April 16, 2017 Tags ECHL, Game Recap, Playoffs, Road TripLeave a comment on Week 27 in Review: We’re Not Done Yet. Season Series: Springfield leads 2-1. Last Game, Thunderbirds: Springfield lost 4-2 to Providence on the road on Saturday. 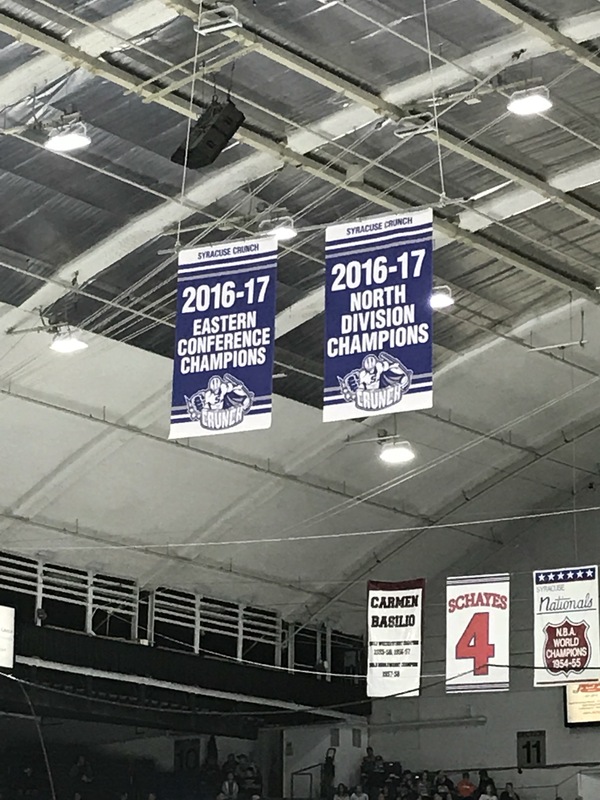 All three games in the season series have gone to overtime, with the road team winning each time; Josh Jacobs was injured during the second period in Syracuse last night, availability today unknown; Albany’s magic number to clinch a playoff berth sits at 22, with a shot at a four point swing this afternoon as 5th place Utica takes on Providence; the Devils penalty kill ranks second in the AHL at 84.7 percent (Wilkes-Barre is first at 86.7); forward Dryden Hunt is on a 5 game assist streak; former Devil Reece Scarlett is out due to an injury suffered in his T-Bird debut. The weekend began in the future digs, as the Devils came into Binghamton for the last time as a visitor (which they had no problem of reminding everyone over and over as the night went on). And they were treated quite rudely by the current tenants in the first period. Jason Akeson would score 1:14 into the contest for a fast 1-0 lead. Then, of all the people, former Devil Brandon Gormley would score in his Senator debut midway through the period for a 2-0 Binghamton lead. After 20 minutes, it looked like another case of the Broome County curse would strike the Devils…but then came the middle period. Not only would Albany only allow just 2 shots, they would rally to tie things up. Ryan Kujawinski would break the Devils scoreless drought 2:59 in with his 6th goal of the season to cut the Senators lead in half. Jacob MacDonald, in his first game under his shiny new AHL contract, would celebrate by tying the game up with 1:19 to go in the period with his 5th goal, a power play marker. In the third, Albany would again dominate play by outshooting Binghamton 15-4, but neither side could get that go ahead goal. After overtime was unable to determine the winner, it was on to the shootout. Carter Camper and Shane Harper were unsuccessful in the first two rounds, while Mackenzie Blackwood was able to stop chances from Akeson, Gabriel Gagne, and Marc Hagel. It was all up to John Quenneville in the third round, and he would connect, giving Albany the much needed win. Blackwood didn’t have much to do all night, only needing to stop 14 of 16 shots through the first 65 minutes. Four different Devils would have one assist each. After being outshot 8-5 in the first, Albany would hold the Senators to 8 shots the rest of the way, outshooting them 44-16 overall. Power Play: 1 for 4. Penalty Kill: 1 for 1. Penalty Minutes: 7. Shots on Goal: 44. Shots Allowed: 16. Shootout: Carter Camper N, Shane Harper N, John Quenneville Y; Jason Akeson N, Gabriel Gagne N, Marc Hagel N.
3 Stars: 1. Ryan Kujawinski; 2. Matt O’Connor; 3. Jacob MacDonald. Saturday: Another day, another callup. With Travis Zajac away from the team due to the birth of his third child and Devante Smith-Pelly out due to injury, it was Blake Pietila’s turn to rejoin the New Jersey lineup. Ken Appleby was sent back down after backing up for one game. It was off to southern Connecticut on Saturday, as the Devils made their last visit to Bridgeport to face a struggling Sound Tigers squad. And it didn’t take long for the visitors to get on the board…25 seconds into the game, Carter Verhaeghe took a penalty. Nine seconds later, John Quenneville was scoring his 12th on the ensuing power play for a 1-0 lead. Bracken Kearns would match that with a power play goal midway through the period for a 1-1 tie. But in a 1:11 span late in the first, Petr Straka (4th) and Greg Wolfe (1st) would put Albany ahead 3-1, chasing starter Jaroslav Halak in favor of Eamon McAdam. After a scoreless second period, the Devils would put the game away in the third. Brian Gibbons would score his 12th with 4:03 remaining to seal the Devils second straight victory and finish off a perfect week. Mackenzie Blackwood was strong between the pipes, stopping 25 of 26 shots. Wolfe and 5 other Devils would each have one assist. Viktor Loov, acquired from Toronto back on February 18th, would finally make his Devil debut. Power Play: 1 for 3. Penalty Kill: 3 for 4. Penalty Minutes: 8. Shots on Goal: 21. Shots Allowed: 26. 3 Stars: 1. Greg Wolfe; 2. Mackenzie Blackwood; 3. Petr Straka. Sunday: With Ken Appleby back in the fold, Andy Iles was released from his PTO and returned to Elmira. This week, it’s all about the PTOs. Well, one former one anyway: the edge goes to Jacob MacDonald for being rewarded for his good work with a new contract, then contributing a goal and an assist on the weekend. Honorable mention to Greg Wolfe for filling in admirably on Saturday and taking home #1 star honors. Albany’s magic number to clinch a playoff spot sits at 25 going into this week’s action. Toronto visits Manitoba on Tuesday, while Syracuse visits Lehigh Valley on Wednesday. 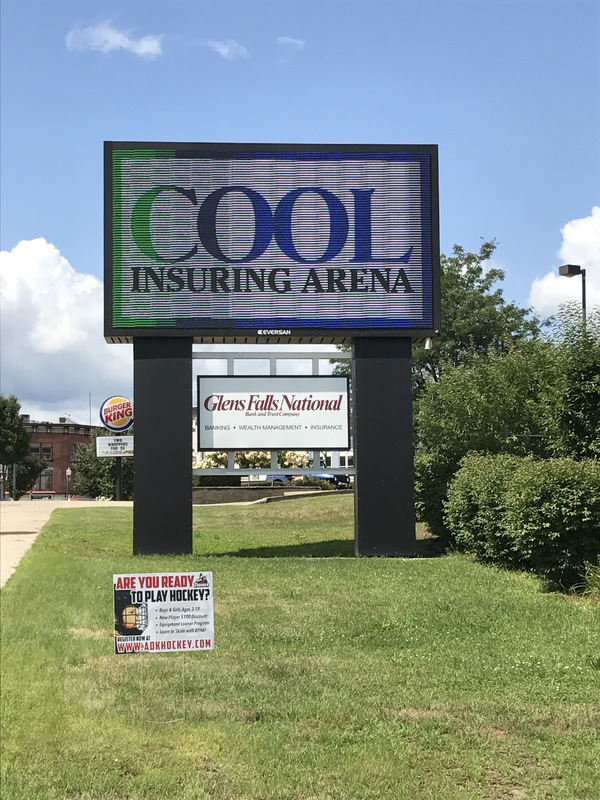 There may be some changes in store before Albany takes the ice again on Friday. It was quite an interesting, high scoring week for the other team in red, as they went 2-2. 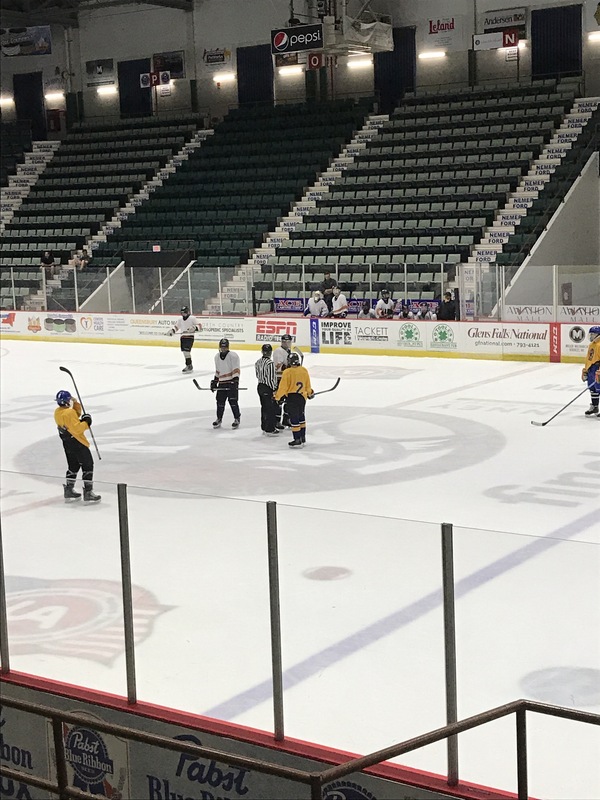 After losing 6-3 to Kalamazoo on Sunday afternoon to finish a disastrous Midwest swing, Adirondack started the weekend off with a 5-0 shutout of Manchester, as Brian Ward scored in his first appearance in almost a month. They would follow that up with a 6-4 win over the Monarchs on home ice Saturday, as captain Peter MacArthur picked up a hat trick. The Thunder would then lose a wild 9-7 game to Brampton on Sunday afternoon, despite a Ward hat trick. 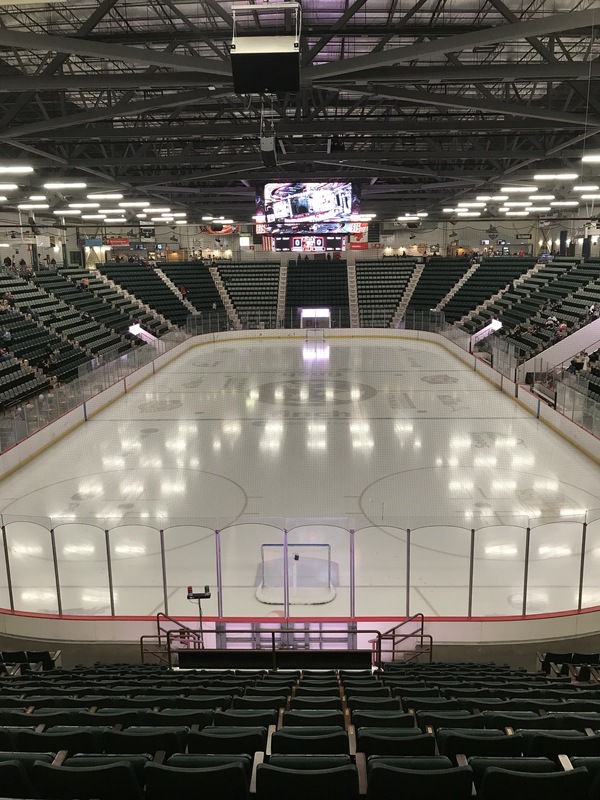 Adirondack currently sits in fourth place in the North Division with 72 points, one point behind third place Manchester and four behind first place Reading, which would qualify them for the Kelly Cup playoffs (like the AHL, the ECHL also has a divisional format for the first two rounds). A 3 in 3 home weekend is upcoming, as the Thunder will host Wheeling on Friday and Saturday, then Atlanta on Sunday. Bad news: it’s a 3 in 3 weekend. Good news: it’s not much travel. Friday, the Devils finally return home to take on Springfield. But then it’s right back on the road for a pair: a big matchup in Syracuse on Saturday night, followed by a trip to western Massachusetts on Sunday afternoon to finish off the series with the Thunderbirds. Also, if Mother Nature is forgiving (then again the way the 2017 portion of the season is going…), the final Awards Banquet with the team is on Tuesday. I will have a post up about that for my midweek update if it takes place.